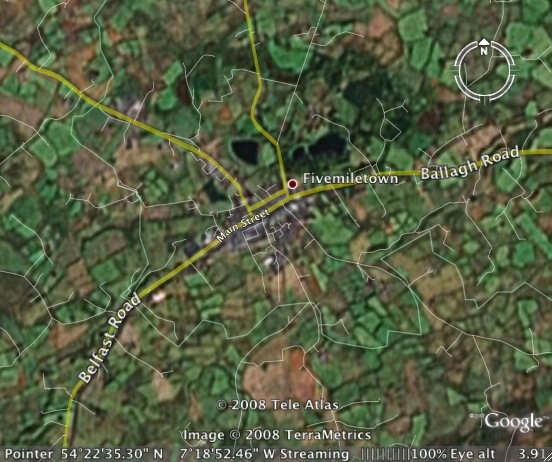 To construct a bypass, to 2+1 standard, around Fivemiletown on the main A4 Belfast<>Enniskillen road. The A4 is the main route into Fermanagh (and on to Sligo) from the Belfast direction. Running from the end of the M1 at Dungannon, the section through the Clogher Valley is the lowest standard on the whole route. While towns along the A4 in Fermanagh were generally bypassed years ago, the A4 runs straight through the centre of the three Tyrone towns of Augher (pop 400), Clogher (pop 300) and Fivemiletown (pop 1,100). These are now the only non-bypassed towns on the A4 from Dungannon to Enniskillen. This scheme will see the largest of these, Fivemiletown, bypassed. The town currently has a one-way system to cope with the heavy traffic on the narrow Main Street, but this delays long distance traffic and is a big inconvenience to residents of the town. The new road will be built to 2+1 standard, meaning that there will be one lane in one direction, with two in the opposite direction to permit overtaking. On longer routes, such as this one, the overtaking lane usually alternates giving an overtaking opportunity to traffic in each direction. The scheme will compliment a 2+1 scheme completed on the A4 near Fivemiletown in 2004. 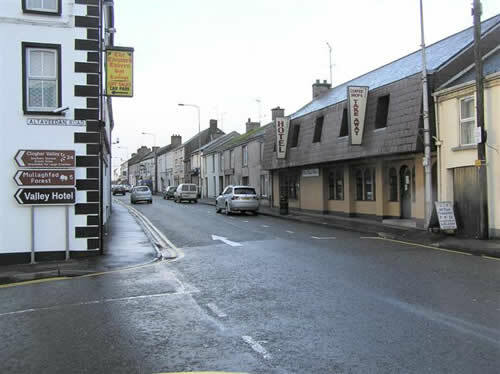 Looking west along A4 Main Street, Fivemiletown in January 2007. Main Street is part of the one-way-system as indicated by the painted arrow. This image was taken from the Geograph project collection. See this photograph's page on the Geograph website for the photographer's contact details. The copyright on this image is owned by Kenneth Allen and is licensed for reuse under the Creative Commons Attribution-ShareAlike 2.0 license.